Bottle gourd is rich in essential minerals, iron and protein. Apart from these, it is rich in fibre which helps in preventing constipation and other digestive disorders. This kootu (Curry) is totally different from our usual kootu. Here the vegetable is cooked in milk and the taste is enhanced with the addition of jaggery / sugar. This can also be served with any Indian bread. Kids will love this combo. Grind to a pasate with little water. Keep aside. Heat oil in a pan. Splutter mustard. 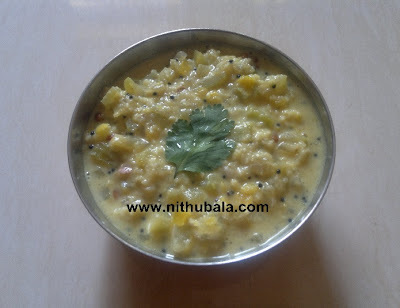 Add urad dhal. Fry till golden brown. Transfer to a bowl. 1. In a pan, add a tsp of oil and chopped bottle gourd. Saute for few seconds. Add turmeric powder, sambar powder and salt. Combine everything together. 2. Add a little water and milk. Allow the vegetable to cook on a medium flame. 3. Now, add cooked dhal, coconut-chilly paste and jaggery. Let the contents thick. 4. Switch off the stove. Pour the seasoning and mix the contents once. 6. Serve with any rice / Indian Bread. 1. You can cook vegetable in water and add milk before STEP-4. 2. You can avoid jaggery/sugar and just prepare it like usual kootu. Creamy & delish, healthy too..Bookmarked!! very healthy and delicious kootu! !